Juno Dawson is well-known as writer for young adults, writing not only smart, contemporary novels but also non-fiction such as This Book Is Gay and Being A Boy. A former teacher, she clearly understands teenagers very well and when I read a couple of her YA horror novels, Hollow Pike and Under My Skin, I felt that she wrote very convincingly from a teen perspective. 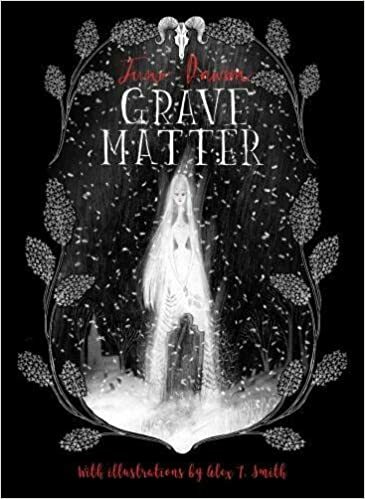 This certainly comes across too in Grave Matter, a creepy Gothic tale of death, grief and black magic. It's a short and easy read at just 96 pages and is illustrated beautifully by Alex T Smith. Seventeen-year-old Samuel is driving in the snow one night when his car spins out of control, killing his girlfriend Eliza. Samuel, utterly devastated, can't be consoled by the words of his vicar father, and turns instead to his estranged aunt who has been known to dabble in voodoo. He's convinced she has the ability to bring people back from the dead - but will she help him? And if Samuel does manage to resurrect Eliza, what will be the consequences of dabbling in the occult? I read this book in one sitting and found it to be a great Gothic horror tale - plus, the text and the illustrations work in perfect harmony. The plot is simple but certainly none the worse for it, and the author does a great job of bringing her diverse characters to life (no pun intended) in such a short book. The horror elements of the story are very well-executed - properly scary at times, in fact - but this book has, at its heart, some genuinely poignant and perceptive things to say about grief, loss and the intensity of serious teenage relationships. This is ideal to read by the fire or hiding under the duvet on a winter's night. There is another element to this book which I'd like to mention. According to the note by the publisher, Barrington Stoke, at the back, it's been produced with reluctant readers in mind. The book itself has a lovely, tactile feel to it, the paper on which its printed is high quality and opaque which minimises eye-strain and blurring, and the font and layout are dyslexia-friendly. Plus, its manageable length means it might feel a bit more accessible to someone who isn't a habitual reader of books. What really struck me was that while this book has been produced specifically for teenagers and young adults who might otherwise find reading difficult or unappealing, there is nothing simplistic, patronising or childish about the language or the story. Well done to Juno Dawson and well done to Barrington Stoke.